Pictures allegedly showing the white version of Sony's rumored Xperia i1 "Honami" surfaced last night, placing the leak-happy 5-incher next to the competition for comparison. 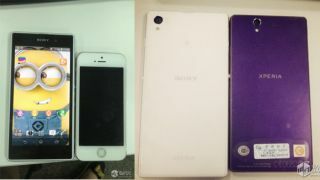 In the photos, posted on the Chinese message board Digi-wo (via Xperia Blog), the Honami can be spied next to an iPhone 5, and it's both taller and wider than its Apple-made rival. The Xperia i1 also appeared next to its slightly smaller cousin, the Xperia Z. Other photos in the set show some of the phone's ports and features, as well as a shot of the phone's camera menu. The other photos published show the Xperia i1 Honami's magnetic docking pins, port flap and top-mounted 3.5mm headphone jack. You can also spy the phone's 20.7-megapixel, 1/2.3-inch sensor G lens camera. Another shot showing the phone's UI seemingly confirms its ability to take 20MP 5248 x 3936 photos. Until these, photos of the black version of the Honami have been more prominent, and this is the most we've seen of the phone in white. Past leaks suggested that in addition to the device's impressive camera, it will sport a 2.2GHz quad-core Snapdragon 800 chip, Qualcomm Adreno 330 graphics, 2GB of memory, 16GB of storage, microSD, LTE and NFC support. A 3000mAh battery was rumored previously as well, a spec that Xperia Blog reaffirmed in today's report. With those stats it seems Sony is vying for the camera phone throne, but with competition from the likes of Nokia's Lumia 1020 and Samsung's Galaxy S4 Zoom, it's going to be a war of at least three kings. Antsy to learn more about the Xperia i1 Honami? You may just get your wish when IFA 2013 rolls around next month.